There is a new energy springing from the ruins of the old labor movement. 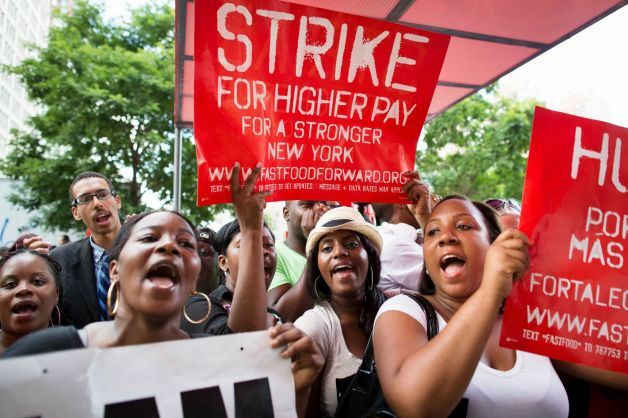 Thousands upon thousands of fast food service workers, retail workers at Walmart, and thousands of other places are spontaneously protesting the conditions that shackle them just as workers have done so many times before when conditions forced them to it. Across the seas Chinese workers and those in Bangladesh and in Europe that is devastated by austerity policies that have failed to both further protect the already rich and permit a man or woman to earn a livable wage are protesting. The gross inequalities of wealth and life produced by contemporary capitalism, with its demands for the ruling class to pursue even greater wealth through even greater exploitation of labor worldwide is beginning to backfire on them. Karl Marx did predict that capitalists would race to the ends of the earth seeking cheap exploitive labor and from this the working class of the world with nothing to lose but their chains would emerge. We are forced to observe he was right! This is not to accept all of what Marxist doctrine espouses but it does fit the present situation. The old configuration of the American Labor Movement as it was during the period of America’s ascendancy during World War II and into the post-war world has been shattered. Employers have found the means to control lawmakers to frustrate the ability of traditional labor organizing methods and traditional means of keeping unions strong and viable. Business conditions and the demands of a worldwide capitalism that is so closely linked have made it impossible for traditionally constituted labor unions to be effective. Consequently, traditional labor unions are being shattered in the public sector just as they were following the PATCO Strike of air traffic controllers in 1981 and in the years of American de-industrialization that followed. Yes, we must all think anew and act anew as an entire new situation has arisen regarding workers worldwide. Workers being defined as anyone who labors for a wage from another and who does not have significantly large investments in the world’s stock and commodities markets to sustain them. Portions of the old labor movement remain and are strong. Where that is the case the new labor movement that is just emerging worldwide can tap into the expertise of the old. But this is a new era where we must think and act anew. Entirely new labor strategies of protest and pressure to force from employers the wages and conditions that are required for the good and meaningful life where workers can have bread but roses too must be adapted to the conditions we now face. New labor leaders who understand these new conditions and how to exploit them past the defenses of management are needed and seem to be appearing en-utero. New technologies such as the internet and I-phones and I-pads, themselves constructed by exploited labor, link the peoples of the globe in ways that were not possible before. The shrinking world puts us in close communion with workers everywhere. Workers now have new demands and new struggles to face in their strivings for a fair and living wage and for the kind of lives that are thereby given greater meaning. It could be argued that capitalism as we have known it worldwide is constantly in crisis itself. Have those who scramble for great wealth and power in the control of greed gone too far? Have they created such conditions of the expansion of wealth that like a plant or animal species that becomes too numerous and invasive that it carries the destruction of itself within it? The 2008-09 financial debacles in the United States carried something entirely new with it. The Capitalists themselves were not in control of their own fate and had to be rescued by governments around the world. The mess in the wake of European austerity, and problems with the common currency, the Euro, are just the tip of a huge financial iceberg that lurks within the system itself. With that lurk new opportunities for the masses of working people everywhere to benefit from what capitalism has done to itself. There are limits to how much the system can gainfully exploit people without sowing the seeds of the system’s own larger collapse. I’m not a communist, nor am I a marxist. But I am not a capitalist. I have to face that fact and be honest about it. While capitalistic methods do have efficacy in worldwide economic development that we need to use, exceeding clear benefits, a kind of working out of the law of diminishing returns for human beings is not what I am about. I’m a loyal American who does not begrudge innovation in business to earn more money for those who make those innovations. I’m not looking for everyone to be equal to everyone else in a pure socialism leading to Communism. But let it be remembered that it was capitalism itself that produced the man in the gray flannel suit and all those houses made of ticky-tacky and they all look the same during the heyday of American capitalistic development in the 1950’s and 1960’s. I must confess to being a Democratic-Socialist who favors socialism from the bottom up, that can fit snugly into private sector economic activity but provide a break on runaway capitalistic exploitation. I favor a people oriented life for workers and not the other way around. My socialism comes from my Christian faith but it can work just as well without it. Socialism, like democracy is not a dirty word. We need them both. One without the other leads only to disaster. What would Jesus do? What did Jesus do? He led a union and favored the sharing of wealth and love and kindness to one and all. We are in a new era just emerging. Instead of American labor languishing in defeat and hopelessness following our many defeats in world trade agreements, the use of the legal system against labor, and employers who move to exploit labor worldwide to weaken it at home, we should be bringing the new era forward. We must think anew and act anew as our situation is new. Rest, relax, and refrain from labor on this Labor Day Holiday. Hold the Fort for we are coming! It is a new labor movement with new ideas and new strategies to improve conditions for all. This entry was posted in Community and Citizen Action, Essays, National Affairs, The State of Labor and tagged Abraham LIncoln, Austerity, Bangladesh, Chinese labor, Fast Food Workers Strike, Labor, Labor Day, New Labor Stretigies, Think Anew and Act Anew, Unions, Walmart. Bookmark the permalink.